Wow, if I ever make it here I\'ll consider it mission accomplished. 23,000 feet is so high I can\'t even imagine it. 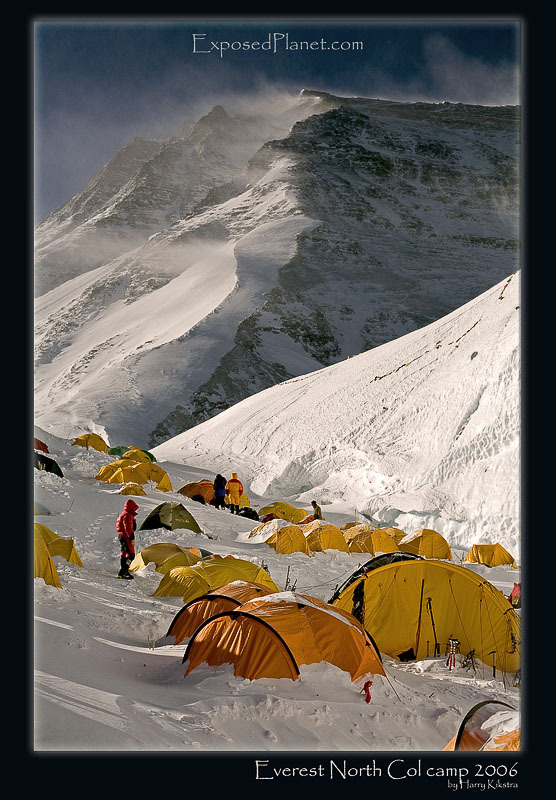 I do not believe there was an offical name given to the 7summits and 7summits club North Col camp. I like Tavern on the Col.
nice lines in this photo .. the eyes have fun discovering the scene … truly the master of alpine backgrounds!!! The story behind "Northcol camp 2006, Everest, Tibet"
Northcol is the saddle between Everest and Changtse (Bei Peak). At a bit over 7000m/23,000ft it is higher than any mountain outside of Asia. Still there is a huge camp here as you can see, mostly as there are a lot more climbers who reach this point than the higher camps, some expeditions even end here on purpose, which is not a bad idea as within one month you can climb to this amazing place. Fortunately there is a big iceshelf -the bright ice-triangle on the middle/right of this image- that protects the tents from the common Western Nepali winds.